It's been centuries since Isabeau St. Croix survived the French Revolution. Now she's made her way back to the living, and must face the ultimate test by confronting the evil British lord who turned her into a vampire and left her buried for two hundred years. That's if she can control her affection for Logan Drake, a vampire whose bite is as sweet as the revenge she seeks. 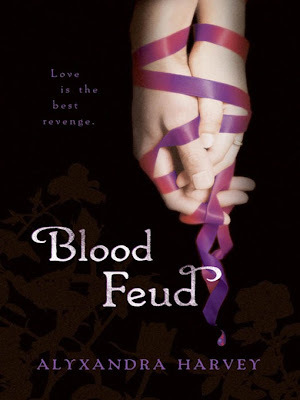 I really enjoyed My Love Lies Bleeding (released in the US as Hearts at Stake) so I was looking forward to Blood Feud and Alyxandra Harvey didn't disappoint me. Instead of continuing the story from Lucy and Solange's perspectives in this installment our narrators are Logan and Isabeau but the time line picks up just after the ending of the first book and we get to find out what is happening with all of our favourite characters. We already know Logan as the second youngest of the seven Drake brothers and Isabeau was briefly in the first book when she saved Solange's life but it was great to get to know them both better. I loved the fact that we still got to see plenty of Lucy and Nicholas though - I absolutely love them both and the banter between them was just as good in this installment. We didn't see as much of Solange and Kieran as I would have liked but if you're trying to focus on too many characters at the same time you often lose focus on the new romance so I'm glad that didn't happen. Logan didn't quite top Nicholas to become my new favourite Drake brother but he's a close runner up and I did really like him. His old fashioned values and gentlemanly manners were really sweet and I loved the way he was confident enough to wear old fashioned clothes and show his own sense of style. We didn't really know much about Isabeau before, she is the Princess of the Hounds and I found it really interesting to find out more about their way of life and the magical abilities they were able to tap into. Alyxandra Harvey has created a really unique mythology around the different types of vampires in her world and it's something I'm looking forward to seeing more of as the series continues. Isabeau has suffered a lot and she is determined to get revenge on the one who turned her into a vampire. I loved the way we get to see flash backs to her past and as you learn what she went through during the French Revolution it is easy to see why she is so wary of everyone now. She doesn't want to admit her feelings for Logan but he manages to creep his way into her affections even when she is determined to keep him out. Alongside the romance Blood Feud also has plenty of action. There are so many different things going on as the Drake family try to deal with the aftermath of the end of the first book (sorry if that sounds vague but I don't want to spoil My Love Lies Bleeding for you if you haven't read it yet), they are trying to sign a treaty with the Hounds and Montmartre is still determined to get his hands on both Solange and the crown. This really is a great installment to the series and I can't wait to pick up Out For Blood, I love the banter between the Drake siblings and can't wait to get to know Quinn better! If you're looking for a fun, action packed and romantic read then you can't go far wrong with this series and it's one I would definitely recommend. This book is an entertaining, quick read. My only real complaint is that since it's such a quick read, the romance feels a bit rushed. Despite this, I enjoyed the book, perhaps not quite as much as I enjoyed the first one, but certainly enough to keep reading the series.